A mature person does not have to be frail and have low energy. Strength training for seniors done regularly not only builds up bone and muscle but can actually counteract the weakness and frailty that comes with aging. A report from the American College of Sports Medicine (ACSM) recommends a program of flexibility, balance, aerobics, and strength training. It suggests guidelines for exercise for frail seniors, but it is more general in its suggestions for other older people. The aging process is a complex process and involves many different variables that can interact with each other. Physical activity cuts across all to contribute to psychological and physical well-being that defines aging in a healthy way. So, let’s break down this program and see what a senior can do to enjoy a longer and healthier life. Training with weights has a positive effect on insulin sensitivity, energy metabolism, and function. 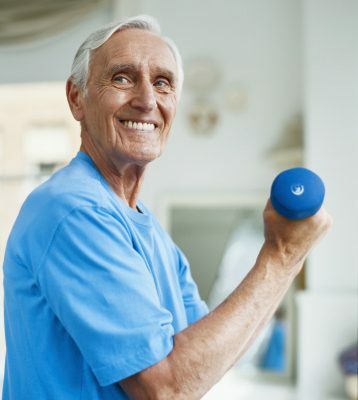 Regular strength training can reverse the loss of muscle tissue and weakness in the elderly. For those who are completely inactive, starting a strength training program first helps your ability to perform aerobic activities. Regular aerobic activity like running, swimming, and cycling are very important. A moderate to high-intensity exercise program may be required to improve all cardiovascular activities. Light to moderate intensity exercise can also help to reduce blood pressure. Stability is especially important in older people, as poor balance can cause a variety of serious injuries. Make sure to partake in exercises that include weight transfer and resistance exercises. Light walking or speed walking is an excellent choice. It is recommended that flexibility exercises are well monitored in older adults. Focus on activities that improve joint range. This can include walking, aerobics, or a light stretching program. Chair Squat: Grab a chair and stand in front as if you were about to sit down. Bend your knees to slowly lower yourself and keep your arms straight in front. Come down to the point where you make contact with the chair and when you do come back up to a standing position. Repeat 12 times. Side Leg Lifts: You can use a chair or table top as assistance. Hold on and lift your left leg outward to the side. For added resistance, you can use a resistance band around your ankles. Repeat for 12 reps and then switch sides. Lat Pulls With Bands: Using a resistance band, hold each end with your hands. Raise arms above your head, wider than your shoulders. Pull down one arm towards your rib cage and then bring it back up slowly. Alternate arms for 12 reps each. Bicep Curls: Holding a lightweight, curl your arm at the elbow upwards and then bring it back down. Repeat 12 times each arm. If possible, you can perform both arms at the same time. Step Ups: Using your staircase, hold on to the railing and step up and down from the bottom step one leg at a time. Repeat 12 times each side. Wall Push Up: Standing a few feet away from a wall and lean forward with your hands flat against the wall and back is straight. Now push off the wall the same way you would a floor push up. To make it harder, stand further away from the wall. Lateral Raises: With a weight in each hand, raise your arm, one at a time, upward in front of your face, then bring it back down. Stand On One Foot: By using a chair or tabletop, try to balance by raising one foot off the ground and holding this position for at least 10 seconds. Practice this on both legs. Walk Heel to Toe: This is similar to a sobriety test. Walk forward but placing your heel in front of your other foot’s toe. Take at least 20 steps like this. Balance Walk: Raise your arms above your head and look forward by focusing on a single spot. Walk straight, but with each step keep your foot raised for a few seconds before placing it back down. Toe Raises: With feet planted on the ground, focus on raising your big toe, but not your foot. Heel Raises: While standing, come up on your toes as to raise your heel from the ground. Many of the problems that older people have are due to weaknesses caused by inactivity rather than a chronic disease, and a physical training program can have a wide variety of benefits that aren’t just physical. Older patients may socialize more frequently, take care of themselves, get out in the community, and experience more thanks to improved confidence!